On this date in 1816, Spain hanged the leaders of a breakaway former New World possession in a vain effort to maintain control of what is now Colombia. The United Provinces of New Granada was la Patria Boba, the “foolish fatherland” of Colombia: a welter of rival provinces and municipalities which capitalized on the mother country’s fall to Napoleon to declare independence and immediately commence fratricidal civil war. The United Provinces had leave of several years for this foolishness before the Peninsular War ended with the restoration of Ferdinand VII, who promptly dispatched a massive expedition under the notorious command of Pablo Morillo to bring these disobedient satellites to heel … and to hemp. The gentlemen whose death-day we commemorate today were the ones at the seat of government when the music stopped playing. Those positions, and even the forms of government itself, had been regularly reshuffled in the Patria Boba as federalist and anti-federalist, republican and royalist, threw their respective weights (and armies) around. Morillo, who is still infamous in Colombia for his cruelty, had the most weight of all. As Morillo’s reconquista invaded the Provinces, Camilo Torres (English Wikipedia page | the much more detailed Spanish) resigned the presidency. Torres is best-remembered now as the author of the Memorial de Agravios (Spanish link; it translates as “Memorial of Grievances” or, more Office Space-ishly, “Memorandum of Grievances”). the union between America and Spain [rest on] the just and competent representation of its people, without any difference among its subjects that they do not have because of their laws, their customs, their origins, and their rights. Equality! The sacred right of equality. Justice is founded upon that principle and upon granting every one that which is his. Stuff like this was liable to get you on Morillo’s enemies list political office or no; cowing — or killing — seditious intellectuals was part of his whole project. Torres, his predecessor and vice president (same guy) Manuel Rodriguez, and several other ministers of state were nabbed together trying to make an escape to sea. Once hemp got through with the necks this day, old-fashioned blades did their redundant work: Torres’s head was hewed off and mounted in Bogota for public viewing. It’s noteworthy that the author of this sort of nasty warning to the public would later sign his name opposite his New World antagonist Simon Bolivar in a Treaty of Armistice and Regularization of War (more Spanish) undertaking to stop murdering prisoners and non-combatants and fight only “as do civilized peoples” — one of the seminal documents in the development of human rights and the law of war. Spanish speakers may appreciate this timeline site on the life and times of Camilo Torres. If the English government had taken such an important step, perhaps today it would not rue the separation of its colonies. But a feeling of pride and a spirit of vanity and superiority led to the loss of those rich possessions. On this date in 1816, Jorge Tadeo Lozano was executed by firing squad in a Bogota temporarily reconquered for the Spanish crown. Scientist, journalist, essayist and man-about-town Lozano (English Wikipedia entry | Spanish) sprang from the stock of New World Spanish nobility. He studied literature, philosophy, medicine, chemistry, mathematics, mineralogy, botany; he served in the Spanish military and traveled in Europe; he returned to his native New Granada, where he became drawn into the liberal ferment with a celebration of the emerging bourgeoisie obviously contextualized by his scientific education. 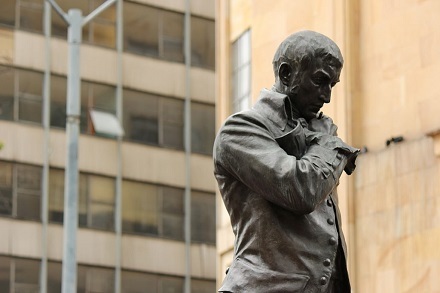 As a member of the constituent assembly, he helped draft an 1811 constitution that acknowledged the authority of the Spanish crown, but not of its viceroy, creating (so its signers thought) a new commonwealth state. 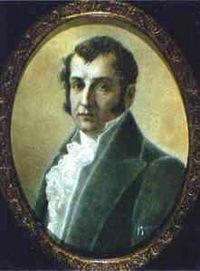 Lozano thereupon became the first President of Cundinamarca, essentially the forerunner to the present-day Colombian presidency. Since Lozano turned out to be a better botanist than executive, he resigned the office after a few months. Only after Europe had sorted out the Napoleonic wars did the Spanish free up the resources for a brutal reconquista of their errant provinces. But when it came, under a general with the macho nickname El Pacificador, it had intellectuals just like Lozano right in its sights. 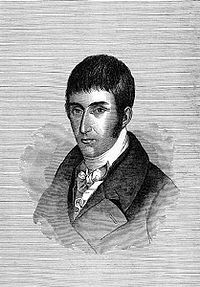 Even though he’d been back at lower-profile scribbling since his stint at the top, Jorge Tadeo was just the sort of guy Pablo Morillo targeted for demonstrative executions over the second half of 1816. Thus perished Lozano this date, along with another intellectual, Miguel Pombo (Spanish link) among a whole train of patriotic martyrs over the months of Morillo’s rule. The policy of killing these men to deprive New Granada of revolutionary potential was, however, an abject failure: just three years after these men were shot as traitors to that distant European line, Simon Bolivar detached Colombia from Spain at the Battle of Boyaca.